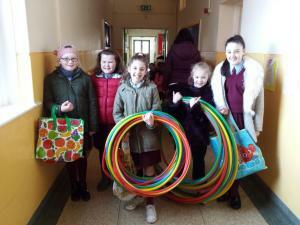 The Active Schools Committee runs the task of distributing and collecting yard equipment daily. Each day, classes are given equipment to play with that encourages them to be active such as hoola hoops, skipping ropes, Frisbees, etc. Every Monday, Wednesday and Friday, music is played on the yard to encourage the children to dance with friends and enjoy yard time even more!